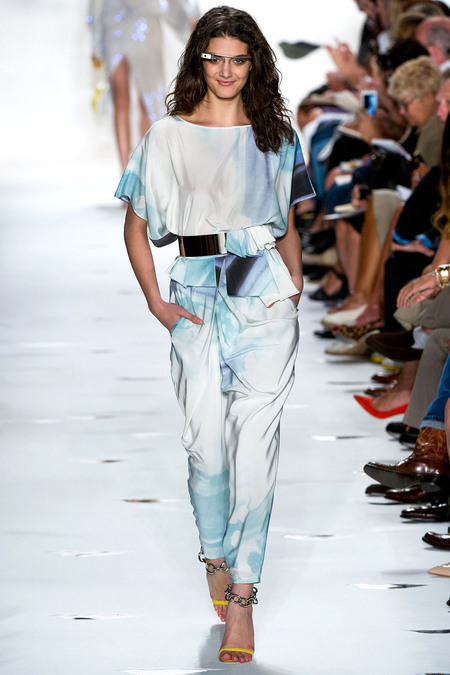 Diane von Furstenberg’s spring collection is not for those who shy away from color. The array of bold tropical colors and billowing silhouettes paint a picture of vacationing in the world’s most exotic locations – surely a testament to von Furstenberg’s extensive travel repertoire. Creative director, Yvan Mispelaere, and von Furstenberg’s inspiration for the collection titled, “Palazzo,” was von Furstenberg’s jetsetter lifestyle. 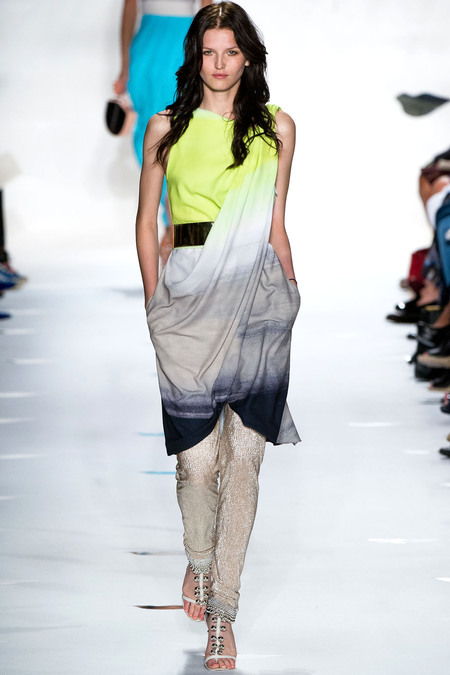 With this collection, DVF brought the local fashions of Mumbai and New Delhi to the American fashion scene. The abundance of looks featuring long tunics and dresses paired with slim fitting trousers outnumber von Furstenberg’s signature piece, the wrap dress. Always known for her body-friendly pieces, the looks are pulled together with waist cinching metallic belts that create an hourglass figure. Keeping up with today’s ever-changing technological environment, the designer partnered with Google to debut their new Glass technology. The glasses that were worn by some of the models, and von Furstenberg herself, recorded behind-the-scenes footage that is featured in a short film about the show. 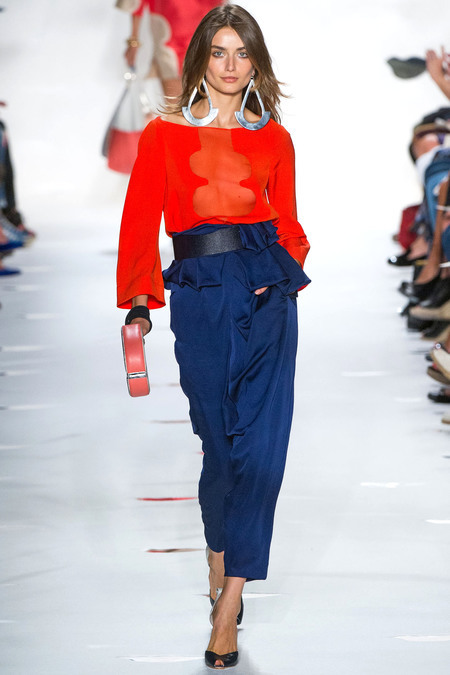 The combination of plunging necklines, bright color blocking and bold accessories exudes confidence, and is made for the self-assured, modern woman. 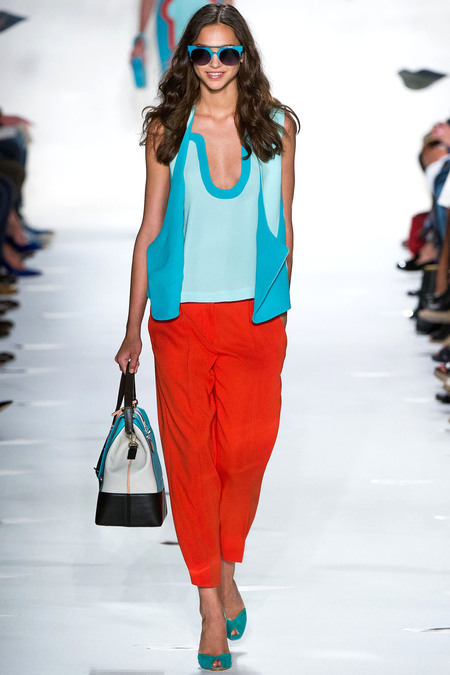 DVF effortlessly updates statement retro pieces and delivers a fantastic collection. Well worth the download. Trust me. Who doesn’t love iPhone apps? Aside from calling, texting, tweeting, facebooking, playing words with friends, and everything else under the sun, iPhones can be a great fashion resource as well. Do you need a wardrobe organizer, a shopping guide, or simply a little bit of inspiration? Would you love some instant fashion feedback? Upload a photo and send it to your friends and community of users for some extra input before you purchase. Take photos of your own clothing, organize it by categories, and then build outfits, make packing lists, and create custom fashion collages. Follow all the Fashion Week trends without sitting in front of your computer all day. Get images, show reviews and video feeds just hours after they appear. The archives even date back 10 years, so you can view and compare runways from many seasons past. See a collaboration of photos from all your favorite style and fashion blogs. Save time and view them all on one site. Ever heard of Guilt Groupe? It is an online site that allows you to become a member and take advantage of amazing sales, up to 70% off designer brands. Well guess what… now they have their very own app. My most recent obsession on Style.com is the designer profiles featuring some of today’s hottest creative minds. There is something absolutely thrilling about putting a face to the label and seeing a designer in real life. A recent designer profile spotlights top designer Tory Burch as she embarks on a search for the perfect playlist for an upcoming fashion show. This video reminds us of just how much behind-the-scenes work goes on in the world of fashion and how many responsibilities fall upon designers. It is interesting to see what music inspires Tory Burch and what tracks she thinks will fit best with her collection. Her bubbly and light-hearted personality is apparent in this three-minute video as she jokes with a colleague and talks to the camera while shopping for music. It is a real treat to have a sneak peak into her daily life. To check out Tory’s song search and get to know the designer on a more personal level, click here. As we cling to our steaming coffee while we trudge through the snow and ice, it is hard NOT to drift into thoughts about Spring and leave the biting February cold behind. Luckily for us, the web offers an escape with plenty of exciting new looks for Spring 2010. Style.com has just released their Spring Buyers’ Guide with their favorite picks for the upcoming season. The clothes and accessories they feature come from boutiques and department stores alike ranging from coast to coast. Although this winter weather can sometimes be a bit of a downer, this collection of trends is sure to cheer you right up. 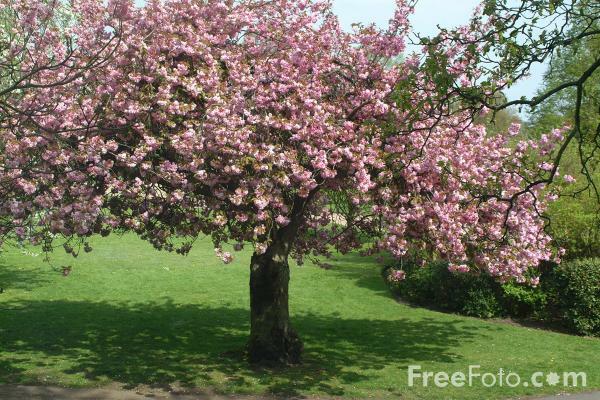 I know one thing is for sure- Spring 2010 will not be bland. This upcoming season is going to be all about brights and patterns. Go crazy this spring mixing patterns and sporting vivid colors- it appears that nothing is really “too much.” I am especially excited about the tie-dye that seems to be making an appearance. One of my favorite pieces in Syle.com’s Spring Guide is a Tory Burch tie-dye skirt (slide 10). Pair it with a solid tank or tee, gladiator sandals and a light scarf and you have the perfect outfit for a luncheon with friends or a day of shopping. 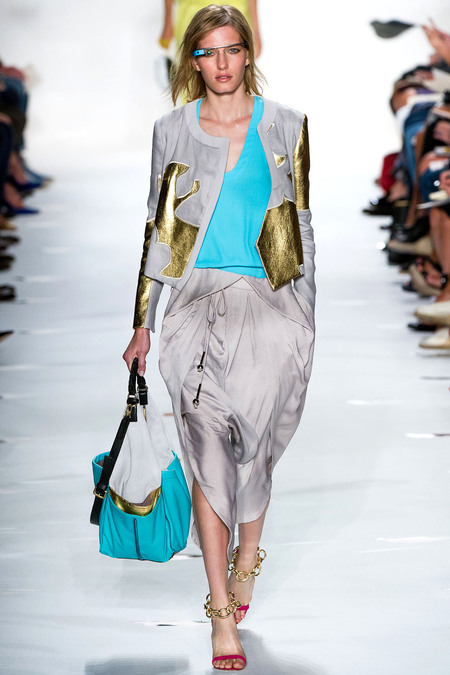 Bold jewelry is also a must for spring and the DVF bangles (slide 53) are a personal favorite. Gladiator sandals, light-weight scarves, bold zippers and one-shoulder dresses and tops will continue to be prevalent this season so feel free combine what you already own with your new purchases. Although it feels like forever until the snow will melt and we will be able to rock these trends, they are definitely worth the wait. In the meantime, warm up by checking out Style.com’s spring selections. Vogue’s website style.com provides an enormous amount of video channels containing anything from runway shows to fashion profiles. I’m loving the channel “The Intersection,” which stops unsuspecting passers-by in the middle of the city wearing looks that are both innovative and chic. Check out the girls strolling through Hudson Square. The streets of Tribeca are filled with this season’s designer finest.